The Asian animation is remembered only often for its service studios. But it is thanks to these jobs in subcontract that firms such as Akom, Far Eastern, Telecom, Imagin and many others were born. During the 1990s they was starting to do theirs independent long-length feature films to level of Empress Chung, A Chinese Ghost Story, Wonderful Days or My Beautiful Girl Mari. This is the real history of a Japanese company that has worked in the shade of the American producers for over 10 years. Enjoy it! 1960 Arthur Rankin Jr debuts its stop-motion TV series PINOCCHIO. This is one of the first U.S.A./Japan's joint works ever made. 1962 Toei releases a short written by Toru Hara: MOGURA NO MOTORO. The animation was supervised by veteran Yasuji Mori. 1963 Osamu Tezuka's animated series ASTRO BOY debuts on NBC. It was the first time of Japanese cel animation in the U.S.A.'s televison. 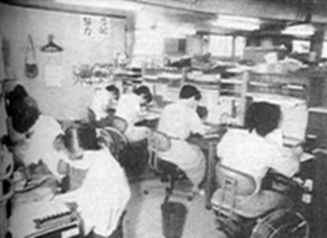 1965 Daikichiro Kusube enters A-Production, a newly-formed subcontracting studio. Takahata and Miyazaki, after a brief permanence in this one, join Yasuji Mori at Zuiyo. 1966 SPEED RACER, the popular anime series, debuts in the U.S.A. It will become one of the most-rated TV series to come out of Japan. 1967 Rankin/Bass release a stop-motion movie titled MAD MONSTER PARTY. It soon becomes a cult hit and is a big influence on Tim Burton's works. 1970 Toei Doga dismisses dozens of employees to save the highest production costs. Kazuo Komatsubara and Koichi Murata found the famous Oh! Production. Toru Hara was born in 1935 at Kitakyusu. He had a degree at Waseda University and planned several Toei's TV-series. Arthur Rankin Jr. made his first trip in Japan in 1958. He designed the storyboards for most of his projects. Jules Bass was born in Philadelphia. 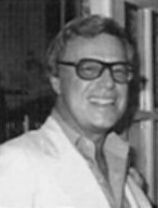 He wrote the lirycs for the most of Rankin/Bass film productions. Away from the center of Tokyo, not too far from Koenji railway station, in an anonymous building there was a small studio, practically unknown to the most greater part of the Japanese. 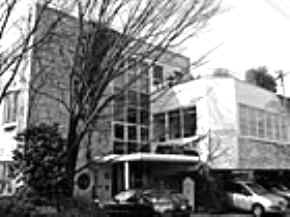 Topcraft was established in February 1972 by several ex-members of Toei. 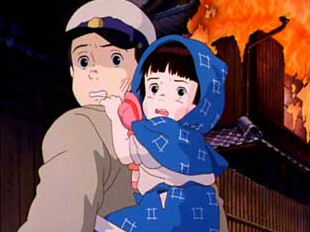 Their President, Toru Hara, had already worked on the planning of Toei's TAIYO NO OJI HORUS NO DAIBOKEN directed by colleague and friend Isao Takahata: this film, thanks to the innovative layout of a young Hayao Miyazaki, has now considered as the true beginning of Japanese animation (which collected only pale attempts by western schools). 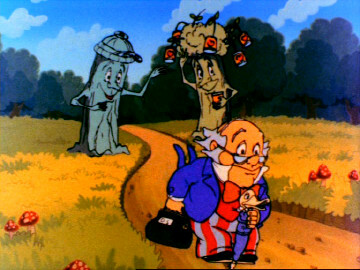 Rankin/Bass Productions, well-known for the stop-motion technique, was charged by ABC to produce a cel-animated TV-series. Toru Hara had to meet Arthur Rankin Jr. for the first time in the corridors of Toei's headquarters, during the making of some TV-series. Topcraft's crew was soon called in order to made a pilot film named KID POWER. Tokiji Kaburaki was in the role of chief director. After the completion of this miniseries, he was immediately called back from Toei for the supervising direction of some important TV-series. Booklet issued for the 10th anniversary of Topcraft. A few some episodes were directed by Katsuhisa Yamada. Despite of his young age, he was highly regarded as a strong creative force during the filming of KID POWER. Prior to this, he worked as assistant director on Toei's TIGER MASK. Subsequently, he directed a few episodes of MAZINGER Z completed (the sole collaboration between Topcraft and Toei Doga: usually those new service studios would go on to do subcontracting for the same firms the founder had just left). The regular series of KID POWER counted fifteen episodes, which were mainly designed by Akio Hosotani, Minoru Kibata and Katsumi Onishi. Each episode was supervised by Tsuguyuki Kubo, known to the American audience, since he did work on JOHNNY CHYPER and the opening sequence for Tatsunoko's SPEED RACER. Topcraft made another three cartoons for Rankin/Bass. The first of these was 20.000 LEAGUES UNDER THE SEA, directed by Tokiji Kaburaki. The film had presumibily been projected as TV-special, but it was at last broken in two episodes and broadcast inside The Festival of Family Classics. Accordingly, the character design is completely different from that of the remaining episodes. The other films were TOM SAWYER and WILLIE MAYS AND HEY-SAY KID. A fourth film exists, from the title THAT GIRL, aired in 1973 but allegedly produced and completed in 1972. 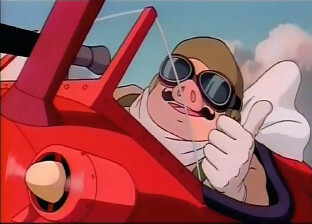 THE RED BARON was the fifth and the last Rankin/Bass TV special to be animated by Topcraft's crew in 1972. 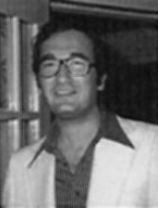 The story was written by Leonard Starr. 20.000 LEAGUES UNDER THE SEA was originally aired in two parts. The first one in October 1, 1972. The animation was overseen by Susumu Shiraume. Later, along with the bankruptcy of Tezuka's Mushi Productions and Toei's momentary standstill in the overseas works, Topcraft became the only production source of Rankin/Bass. During 1973 and 1974, no more screenplay arrived from the United States. Topcraft eventually worked on several home TCJ/Eiken's TV-series and was also very helpful in realizing some episodes of KAGAKU NINJATAI GATCHAMAN under Tatsunoko's commission. For the Americans there was only a pilot film for an unaired sequel of 20.000 LEAGUES UNDER THE SEA. The Japanese historian Yoko Gomi affirms that Topcraft also completed three episodes of Rankin/Bass TV-series JACKSON 5IVE (a substantial number of episodes of this was outsourced at Halas&Batchelor's facilities in England). Finally, in December 1974 was produced a TV-special entitled TWAS' THE NIGHT BEFORE CHRISTMAS. Jerome Coopersmith did screenplay (even if it was accredited to Romeo Muller by Japanese fonts, I prefer to use the official info by Rich Goldschmidt). The key frames were achieved by Hiroshi Oikawa, Yoshinori Kanemori and Katsumi Aoshima, while the storyboard was prepared from Keiji Hisaoka. During 1975, Topcraft made a short-length TV-special written by Julian P.Gardner entitled THE FIRST EASTER RABBIT. Minoru Nishida worked as art-director, designing most of the backgrounds. 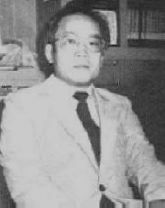 In 1975 was also assumed an ex-employee of bankrupted Zuiyo named Kiyoshi Sakai, who started as production assistant and then became studio's manager. Frosty, a nice snowman originally created by cartoonist Paul Coker Jr and redesigned for animation by Tsuguyuki Kubo, was the main character of next TV-special, titled WINTER WONDERLAND. It was animated by Susumu Shiraume, Hidemi Kubo, Yoshiko Sasaki and Tadakatsu Yoshida. Frosty had to appear for the first time in a TV-special dated 1969, which was actually made in Japan (precisely by Mushi Productions). WILLIE MAYS was the first Rankin/Bass title to be aired in ABC Saturday Superstar Movie. The animation was supervised by Hiroshi Wagatsuma. 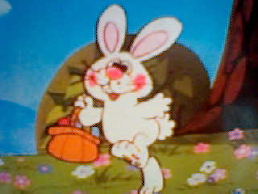 THE FIRST EASTER RABBIT was originally broadcast by NBC. The characters were designed by Paul Coker Jr, while the storyboard was done by Keiji Hisaoka. A young man named Kazuyuki Kobayashi, took care of the continuity design on each of these three TV-specials. Kobayashi become animation supervisor after only two years (usually it need at least five years in order to fullfill such a practice). At first, he was one of the I/B animators on KID POWER. He was soon called as key animator on Toei's MAZINGER Z. Up to 2009 he kept the employment at Studio Gallop. Hidemi Kubo, brother of the well-known Tsuguyuki, also did the continuity design and layouts for two of the most popular Tatsunoko's TV series, such as TIME BOKAN and PAUL NO MIRACLE DAISAKUSEN, in which were also involved Fumiko Kawada, Yoshiko Sasaki and the veteran Minoru Kibata. Still of 1975 it is a Germany/Japan co-production from the title MITSUBACHI MAYA NO BOKEN (MAYA THE BEE) and achieved by Zuiyo Eizo. 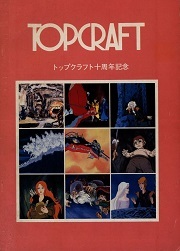 Topcraft made an undetermined number of episodes with the key animators Yasushi Hirakawa, Yoshinori Kanemori and Hiroshi Oikawa. There is another 1999's TV series aired in Japan and internationally known as BARBAPAPA AROUND THE WORLD, but it is a Studio Pierrot production. DR. SNUGGLES was originally conceived and created by British writer Jeffery O' Kelly. Six episodes were animated by Depatie/Freleng Inc.
1977 opened with a long TV series very known to every European and Japanese children: BARBAPAPA. It was developed from the original illustrated tales by Annete Tison and Talus Taylor and a lot of episodes were directed by Katsuhisa Yamada and Koichi Sasaki. This was the first joint work that Topcraft made with the Netherlands. A small Japanese agency named K&S purchased the rights of some western characters to make TV series with the principal purpose to sell them to foreign clients. Even Pagot's CALIMERO was made by K&S (in association with Toei) and aired in Japan only months after. 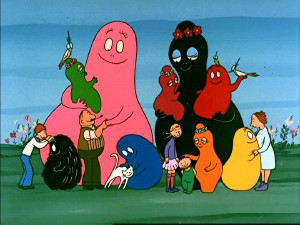 The first season of BARBAPAPA, 45 episodes partially made at the studios of Tama Productions, was co-produced by an European consortium and aired for the first time in France during 1974 by TF1 (LINK). Due to the popularity of the original booklets published in Japan, Tokyo-12-Channel (today TV-Tokyo) eventually bought the TV series and commissioned a second season to Topcraft (with the supervision of Polyscope BV and economic funds by Frank Fehmers Productions). In a recent interview to Cartoon on the Bay, the author confirms that the whole phase of pre-production was achieved in France and that only a part of the 1977's season was broadcast because several episodes would have had a mediocre quality. 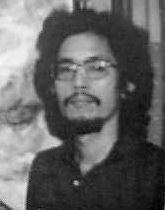 The website NNgallery reports that Chew Kiat Lim was storyboard artist during 1975/76 (LINK). The info about the 1977's Japanese broadcasting has been confirmed into Japan TV Anime History (LINK). 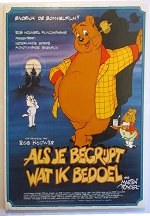 We don't yet know anything about mysterious Dutch TV series entitled DOCTOR SNUGGLES, except that the animation supervision was done by Tsuguyuki Kubo. Both the series were aired in the USA during 1981 through LBS Communications. The series has also influenced the Italian language introducing a diffused neologism: Barbatrucco. When American producers wanted to made a faithful animated version of J.R.R. 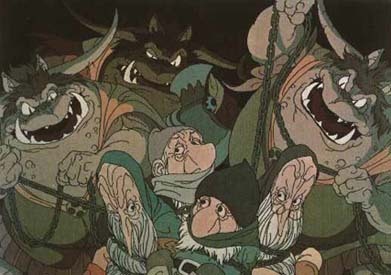 Tolkien's THE HOBBIT, they applied once again to Toru Hara's studio, where some of the famous illustrator Arthur Rackham's works were accurately examined. Thanks to experience provided by supervisor Tsuguyuki Kubo this TV special had to count no less of 40.000 cels, boasting about nearly two-hour of good animation. The beautiful backgrounds were made by Hidetoshi Kaneko and Kazuko Ito under artistic supervision of a veteran such as Minoru Nishida. Direction and screenplay were respectively assigned to Katsuhisa Yamada and Romeo Muller. In the collectors world is still valued the album relesed by Disney's Vista Record, that owned a splendid film-book (Disney group already released the soundtrack albums of 'TWAS THE NIGHT BEFORE CHRISTMAS and WINTER WONDERLAND). This TV special won the Christopher Award and it was the first TV product of any work by South African author J.R.R. Tolkien as well. 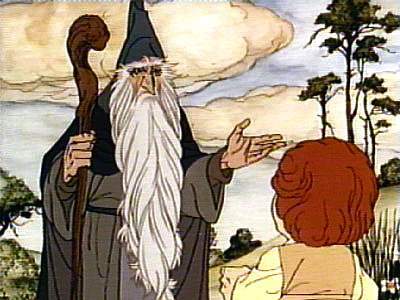 Very important for success of it, was the voice characterization of Bilbo, for which had been called a best-known talent actor such as Orson Bean. In the same year, Topcraft was once again helpful to Tatsunoko, since this one was involved in a co-production with France's Procidis. During its filming, Tomoko Kida left Tatsunoko to join Topcraft's editing department. 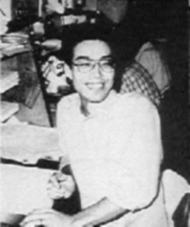 In the course of 1977, Hidekazu Ohara was also employed in the I/B animator role. After Topcraft disbandment his apparitions in the world of TV animation will be rare. He undertook the career of director for commercial shorts. THE HOBBIT was originally premiered in November 1977 on NBC. It brought Rankin/Bass at a whole new adult's audience. 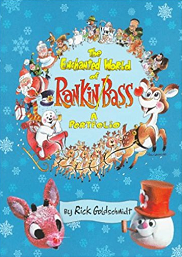 Thanks to this work, Arthur Rankin and Jules Bass had a prestigious Peabody Award. It was the most awarded Rankin/ Bass TV special. It captured the strong feel of Tolkien's book and was recently released through LORIMAR-Telepictures. It was premiered on NBC during May 1980, but it was actually completed at the end of 1979. THE HOBBIT and THE RETURN OF THE KING have at time been relased on VHS from Warner Home Video. Now they are available on DVD, but only in NTSC. In the period between the production of these two titles, Topcraft made a musical tv-special based on Dickens Christmas Carol titled THE STINGIEST MAN OF TOWN. It was realized for NBC and features the voice talent of Walter Matthau. 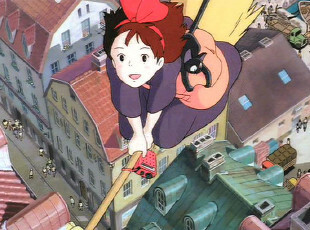 Masahiro Yoshida, Fumiko Kawada and Yoshiko Sasaki were key animators, while Kazuko Ito did the background paintings based on Kazusuke Yoshihara's layout. Its final cost was 1,5$ million. This Rankin/bass special was also the only one to be broadcast in Japan. Because of this, some sources consider it to be anime (by the definition of the word which refers exclusively to Japanese animation). A rare photo of Topcraft's I/B department. London's ITC Films heard rumors about these works and so chose Topcraft to make an animated feature film of THE LAST UNICORN in association with Rankin/Bass. Peter S. Beagle, original author of this novel, entirely planned the screenplay and a little part of the storyboard together with co-director Katsuhisa Yamada. It was one of the few cel-animated feature films produced by Arthur Rankin Jr. to be theatrically released and it was presented by Lord Grade with Martin Stanger in role of associate producer for ITC. 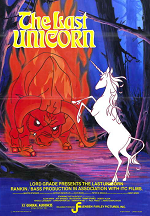 THE LAST UNICORN took no less than 17 months in order to complete it: the production started in the middle of 1980 to be finished in October 1981, just in time for the Christmas distribution. 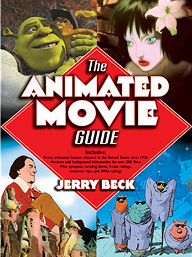 The film has the boast to have been animate with 75.000 cels, the highest number ever performed for a work of Rankin/Bass (if it is hypothesized that there they have worked around twenty I/B animators for such period, it is easy to realize that each of them had to draw at least 10 sheets a day). The tecnique was further enhanced despite that of previous movies, thanks to the ability and patience provided once more by supervisor Tsuguyuki Kubo. Every phase of the film was made inside the studio, including the sound effects. by Don Duga and Tsuguyuki Kubo. The virtuous movements of camera were done by Hiroyasu Omoto and his assistant Koji Shiragami. The artistic direction was done by three greatest artist as Minoru Nishida, Mitsuo Iwazaki and Kazusuke Yoshihara, who created some of the most sumptuous background paintings ever seen. 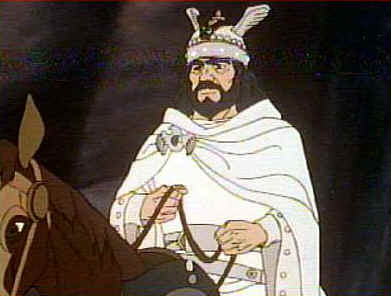 Mia Farrow did a wonderful voice for Amalthea, as did Christopher Lee for evil King Haggard. In fact, this may be considered one of the most talented voice cast Rankin/Bass has ever assembled. During the Christmas festivities it is regularly aired under the title DAS LETZTE EHINORN by the German network RTL2, which has also allowed many Italian fans to admire the splendid Kazuyuki Kobayashi's sequence, in which thousand of unicorns take life from the waves of the sea. A latest curiosity: Lee also send his talented voice for the German dubbing. A new live/CGI version of this movie had been announced during 2003, but it is not a Rankin/Bass production (in 2006 IMDb shut down their page, since they were unable to verify that the film was actually being made). 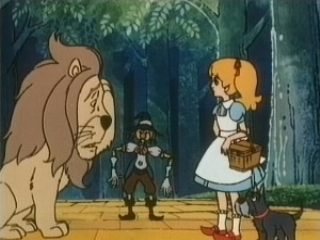 THE WIZARD OF OZ was a 1981 Japanese anime feature film directed by rookie Fumihiko Takayama (He started its career in 1978 as camera operator on episodes 24 and 29 of SHIN LUPIN SANSEI). The movie was based on classic book by L. Frank Baum, and produced by Yoshimitsu Banno and Katsumi Ueno for Toho. At Topcraft was prepared a substantial portion of key frames by the hands of Mitsuru Hosoya. It was distributed the United States by Paramount Pictures: this movie was at last dubbed into Japanese for release in the country in 1986. The music of the film were composed by a person not yet very famous: Jo Hisaishi. THE FLIGHT OF DRAGONS was broadcast in the USA four years after its completion. 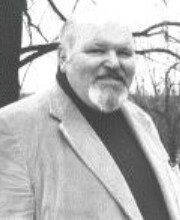 The additional screenplay was written by Jeffrey Walker. Alan L. Gleitsman supplied the role of executive producer in the US version of THE WIZARD OF OZ. It has no relation with 1986's TV series. 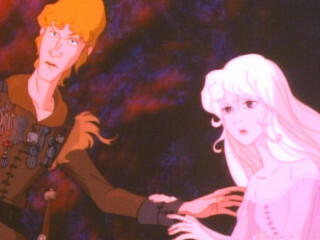 1982 marked the latest co-production with American Rankin/Bass and it was named THE FLIGHT OF DRAGONS. The script was principally based upon the Peter Dickinson's fantasy book by the same title and upon the relatively unknown book THE DRAGON AND THE GEORGE by Gordon R. Dickson. The TV special conveied a plain enviromental message, but never didactic. 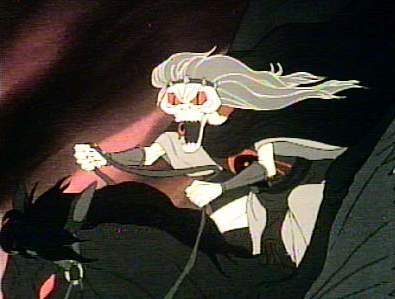 The animation presented many similarities with THE HOBBIT and the previous THE LAST UNICORN, since it was mostly made by the same animators team. Tadakatsu Yoshida and Hidemi Kubo, with the aid of Susumu Shiraume, took care of the entire layout design, inspired by original book illustrator Wayne Anderson. Katsuhisa Yamada and Fumihiko Takayama did storyboard and co-direction. This time were recruited young key animators, such as Mitsuru Hosoya, Yoshiji Kigami, Mariko Aizawa and Toshio Kaneko. For the first time in his career, Takashi Watanabe did the key animations. He was born in July 22, 1957 and started its career as I/B animator in 1977. He's today a well-liked director, thanks to the successful TV series SLAYERS. 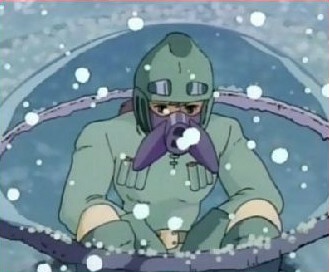 As already occurred in the WINTER WONDERLAND's US version, Kazuyuki Kobayashi was wrongly credited in key animator's role, when he instead took care of continuity design. 1982 also saw Topcraft involved in two TV series for the Japanese audience. The first one is the sequel (never aired) of YOKAI NINGEN BEM, for which two episodes were completed only. The second was the animated transposition of the MGM's masterpiece movie "The Yearling", KOJIKA MONOGATARI, in which the key frames were signed by Tadakatsu Yoshida, Mitsuru Hosoya and Yoshiko Sasaki. Toward the end of the same year, Kazuyuki Kobayashi and Katsuhisa Yamada respectively took care of continuity design and direction of JERINKO CHIE's episode 45. This is was not the first time Topcraft worked for TMS. 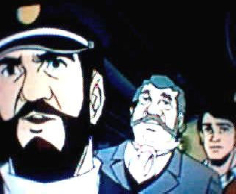 In fact, Topcraft produced the animation on some episodes of SHIN LUPIN SANSEI. Later, Tsuguyuki Kubo took care of the entire layout design on the Rankin/Bass production of THE CONEHEADS; the name of the studio is still unknown, except that the camera operations were provided by Trans Arts. In according to Wikipedia, it is rumored that Nelvana's EASTER FEVER was made by Topcraft, but we cannot prove it to be true. Hayao miyazaki was born at Tokyo in January 5, 1941. At beginning of his career he worked on Toei's OKAMI SHONEN KEN and MAHO TSUKAI SALLY. Isao Takahata was born in October 10, 1935. ALPS NO SHOJO HEIDI, AKAGE NO AN, and JERINKO CHIE are some of the famous TV series directed by him. Meantime, inside one of many Tokyo's offices, Hayao Miyazaki and Isao Takahata ran against TMS president Yutaka Fujioka, who wanted to involved them in the planning of LITTLE NEMO (a feature film co-produced with foreign financial benefits). But Miyazaki had never accepted any order from the commercial managements. After the CAGLIOSTRO's commercial failure he was employed as teacher at Telecom Animation Film (TAF): it was and still is the most important TMS subsidiary. Soon afterward, he was called by Tokuma Shoten to realize an animated version of its manga NAUSICAÄ. With much of disappoint of the Animage readers, it was interrupted to develop MEITANTEI HOLMES, a very expensive TV series co-produced between TMS and Italian Rever. Howhere, HOLMES was frozen after just four episodes completed, because of some economical problems. So, Isao Takahata, in its new role of executive producer, was in charged to find a production facility able to make NAUSICAÄ, since Tokuma was a publishing house with no experience in animated films. Altough TMS owned the necessary know-how, it was promptly set aside, because of recent disagreements. Toei Doga, Sunrise, Tatsunoko and the most of Japanese major firms were fully absorbed in the production of a number of TV series. Accordingly, a multitude of new smaller studios began popping up all over Tokyo. Isao Takahata with no doubt chose Topcraft, whose works were already known by him. Toru Hara's studio would be ideal in capturing all of the fantastic atmosfers in which Miyazaki had set its Nausicaa's characters. Topcraft was one of the few subcontracting studios to develop a product from the phase of storyboarding to reach the phases of editing and shooting (a multiplane camera was purchased in 1976). As well as, Toru Hara had been really the first producer to believe in Miyazaki 15 years before, making to go out him of the anonymity. In those days, Topcraft had finished some segments for a feature film on behalf of Dutch Toonder Studios and a few episodes of Sanrio's BUTTON NOSE were in working. Subsequently, Hayao Miyazaki left TMS to join the not previously widely known Topcraft, where he realized his definitive masterpiece. It will be soon acclaimed as a real cult-movie from public and critic all over the world. The film's message was clearly against every war and pro-enviromentalist. Akira Kurosawa said: "KAZE NO TANI NO NAUSICAÄ spread the Miyazaki's fame out of Japan. I really respect it!" (taken from SEN TO CHIHIRO Italian press-release). A sequence designed by Kazuyuki Kobayashi. This evocative sequence was done by Hidekazu Ohara. About NAUSICAÄ Kazuo Komatsubara was chosen as animation supervisor and character designer (he was already main planner in Takahata's masterpiece GAUCHE THE CELLIST). A part of the key-frames were done by Kazuyuki Kobayashi and Yoshinori Kanada, who animated all the hard action sequence for the film. Furthermore, Isao Takahata called some of the most capable veteran free-lance such as Yoichi Kotabe, Noboru Takano and some members of Oh! Production like Tadashi Fukuda and Kitaro Kosaka. This time Mitsuki Nakamura did art director. The color style had no difference with that of THE LAST UNICORN, since Fukuo Suzuki took care of both movies color designation. There also worked in it two young man named Hideaki Anno and Mahiro Maeda. Hideaki Anno himself was one of the main GAINAX's founders, and he conceived one of the most recent successful TV-series such as FUSIGI NO UMI NO NADIA. 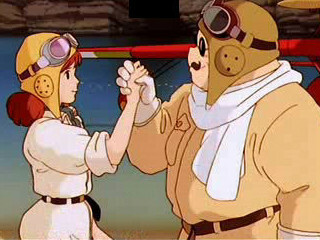 Accordingly, Mahiro Maeda did the prop-design for NADIA, but, at the same time, maintained the collaboration with Ghibli. This very complex part of the layout was prepared by Tadakatsu Yoshida. 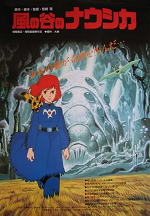 Thanks to the help of some external facilities, NAUSICAÄ was completed and distribuited in March 1984 (in fact, no animation studio could make an entire long-length movie by itself; in this case were involved Doga Kobo, Yamato Production and Kusama Art to name a few). 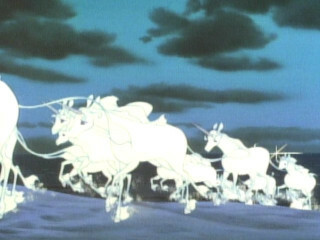 Curiously, NAUSICAÄ counted just 56.000 cels against around 75.000 cels of THE LAST UNICORN, which was produced for an exigent American audience, requiring a highest technique. NAUSICAÄ instead got its success thanks to spectacular action-scenes, dramatic close-ups, wondering SFX and an innovative use of camera supplied by a young Koji Shiragami. A high quality animation requires 24 cel pictures per second. This was the standard for Disney, but it was held too much expensive for Japanese firms to cope with. In fact, they makes only 8 cels and each cel is triplicated by the camera operators. They generated exactly 24 cels per second! Despite of the scarce advertising, it was one of the most resounding hit of Japanese cinematography's history, receiving several awards all over the world. Although it was their first film to be produced for homeland's audience in the last twelve years, the names of Topcraft's members became really famous. . The merit of this success had to be tributed to a clever Animage's redactor named Toshio Suzuki, who worked in the production committee. Initially, Kazunori Itoh was scheduled as co-screenwriter, but in the final version its name wasn't listed, supposedly because of a sudden escape due to incomprehensions with Miyazaki. Tsuguyuki Kubo and Topcraft's crew were also helpful in the making of MACROSS AI OBOETEIMASUKA, released from Tatsunoko in the same year. Taking advantage of NAUSICAÄ's largest success, THE LAST UNICORN got a Japanese VHS version by CBS/FOX Home Video. 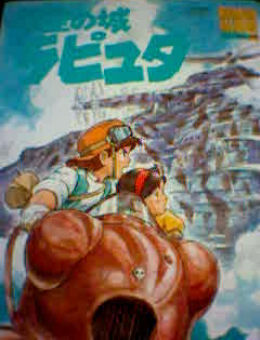 Jean Moebius said: "While LITTLE NEMO took six years to finish, Miyazaki made KAZE NO TANI NO NAUSICAÄ in nine months!" (taken from the book Hayao Miyazaki Master of Japanese animation). This was not a co-production, although IMDb ranks it as a Cinar's TV series. 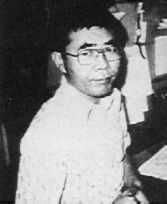 Kazuo Okada was involved as artistic supervisor in all of the episodes. In 1985 they were to be completed the last episodes of BUTTON NOSE. A children oriented TV series produced by Sanrio Film of Hello Kitty's fame. 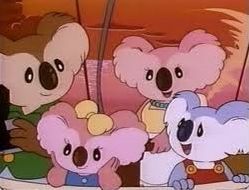 Topcraft was also producing a 26 episode TV series titled KOALA BOY KOKKI. In spite of being a story for a children audience, it had a fluid animation, thanks to the experience provided by Kazuyuki Kobayashi, Hidekazu Ohara and Masahiro Yoshida. It was directed by Takashi Tanazawa (production assistant in THE LAST UNICORN and director's help in KAZE NO TANI NO NAUSICAÄ). 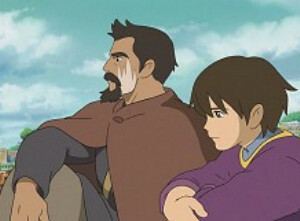 During its filming, Hayao Miyazaki and Toru Hara were urged from Tokuma to produce a new movie feature. Hayao Miyazaki, set aside continuation of KAZE NO TANI NO NAUSICAÄ to develop a new boys' adventure story for theatrical release. 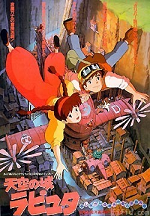 At the end of this TV series, Topcraft's employees had to wait final communication for changing the trade-name for Studio Ghibli (Ghibli is the name of one of the favourite Miyazaki's Italian airplanes). 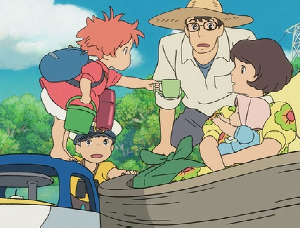 In consequence of it, many of its members left Toru Hara, maybe for the Miyazaki's severity or, probably, because of decision to pay them by a piecework contract. Long time before, many animators left Toei Doga for the same reason. 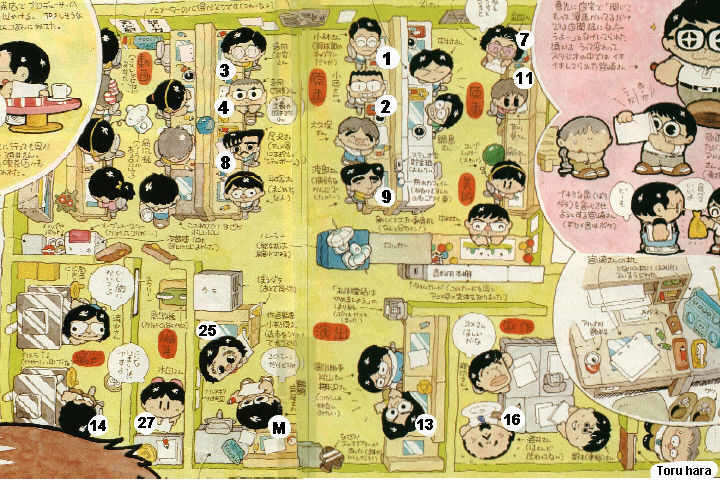 Tsuguyuki Kubo did the entire layout design on the special THE WIND IN THE WILLOWS, made at Cuckoo's Nest Studio in Taiwan. After some irregular collaborations, Katsuhisa Yamada chose to establish oneself at Madhouse, where he directed some episodes of well-famous fantasy OVA saga titled RECORD OF LODOSS WAR. Even if for a short time, Topcraft employed many others well-known artists, such as Keiji Hisaoka, Katsumi Aoshima and Yoshinori Kanemori. Hisaoka did the storyboard for THE HOBBIT and its sequel. He left for taking back the career of director at Toei Doga. Aoshima and Kanemori left Topcraft almost immediately in order to establish their own studio. During the 1990s, Katsuhisa Yamada and Yoshinori Kanemori respectively took care of direction and continuity design on Hanna & Barbera's TV series of THE PIRATES OF DARK WATER, made at Madhouse studios. Katsuhito Akiyama and Yukimatsu Ito did the most of the storyboards. This was signed by Shigeru Ohmachi in 1988. The complete show counted 125 half-hours. Some of these were shipped and completed in Korea by Hanho Heung Up. After Topcraft break-up, Tsuguyuki Kubo, Tadakatsu Yoshida and Minoru Nishida moved at Pacific Animation Corp. (also known as PAC). PAC was principally formed to carry on the work that Topcraft were doing for Rankin/Bass. 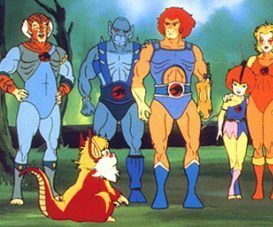 This time on their longest TV series: THUNDERCATS. PAC was founded in 1985 by Mushi former member Masaki Iizuka (with Rankin's encouragement) and then sold to Buena Vista in 1989, when for Arthur Rankin and Jules Bass the moment of their retirement came. We've to suppose that it was for a long time that Disney's managers followed the movements of the ex-members of Topcraft. Iizuka took care of most of Rankin's Tokyo affairs as associate producer and he also was in charge of the president of Walt Disney Animation (Japan) until 1992. The last TV series produced by PAC for Rankin/Bass was COMIC STRIP, which contained four mini-series: TIGERSHARKS, KARATE KAT and MINI-MONSTERS (both in conjunction with E&G FILM), and for last STREET FROGS (drawing under guidance of the Japanese staff was made at some Taiwan studios). 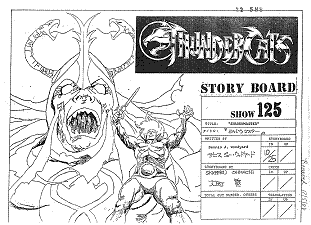 Arthur Rankin Jr. said: "THUNDERCATS was made by our animator group in Tokyo which has worked for us for almost all of our films. They are headed by Masaki Iizuka, who has been with us for over twenty years, I am eternally grateful for the splendid quality we have achieved together". The PAC's banner was then seen to appear into the Hanna & Barbera's newest TV series THE REAL ADVENTURES OF JONNY QUEST. In theirs first years of activity PAC and Studio Ghibli shared the same building at Kichijoji. Miyazaki himself corrects the principal drawings of LAPUTA. Howsoever, TENKU NO SHIRO LAPUTA, the very first official film marked Studio Ghibli, was punctually premiered in May 1986. Before the production started, three young skill animators are employed: Shinji Otsuka, Toshio Kawaguchi and Katsuya Kondo (he was working at Annapuru on some overseas co-productions for TMS). The screenplay, freely taken from some western classic books by Robert Luis Stevenson, Jonathan Swift and H.G. Wells, was entirely written by Hayao Miyazaki, who had just returned from a brief journey in Wales. The main staff was almost entirely renewed, from animation director, Tsukasa Tannai, to key animators Masako Shinohara and Masaaki Endo, and with the clever art director Nizo Yamamoto (they previously worked upon many of the TMS masterpieces). Takahata, once again executive producer, recalled Kazuyuki Kobayashi, Megumi Kagawa, Mahiro Maeda, and Kazuhisa Nagai. 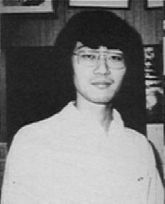 Kitaro Kosaka, Tadashi Fukuda and Hirotsugu Kawasaki (uncredited layout assistance on NAUSICAÄ) were involved again in charge of key animators for Oh! Production. The final scene in which Pazu fight against Muhska was designed by special-guest animator Kazuhide Tomonaga, who was one of the main key-layout designer on LUPIN SANSEI CAGLIOSTRO NO SHIRO. At that time, he was still working for TMS and today he's still employed at Telecom. Michiyo Yasuda, who was in the staff of the best-loved Miyazaki's TV-series of MIRAI SHONEN CONAN, did a wonderful use of colors. The amazing movements of camera were made by veteran Hirokata Takahashi, together with Koji Shiragami. 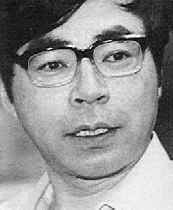 Toshio Suzuki, one of the greatest Miyazaki admirer was this time in charge of the production committee. 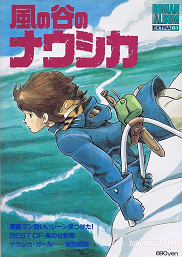 Although there were all premises for a new redounding success, TENKU NO SHIRO LAPUTA boxed less than KAZE NO TANI NO NAUSICAÄ. Toru Hara gambled too much in its market politics: "High costs, high risks, high returns" (and scarce advertising...). Always in 1986 it appears on the screens the beautiful TV-series OZ NO MAHO TSUKAI, produced by Panmedia. On the most of the episodes the key frame were made by all the most famous artists of Topcraft's era, among which Tadakatsu Yoshida, Tomohiko Okubo and Kazuyuki Kobayashi. In the production of LAPUTA were involved Studio Gallop, Visual 80, and Studio Fantasia. Naoshi Ozawa was once again head of I/B department. The beautiful theme song lyrics were written by Hayao Miyazaki himself, composed by Jo Hisaishi, and sung by 21-years old Azumi Inoue. In 1987, along with the announced coming in the Ghibli's main staff of Yoshifumi Kondo and Yoshiharu Sato (both artists of Nippon Animation Co.), two long-length feature films were to be announced at the same time. They have once more been produced by Toru Hara, this time in the role of executive. The first one, HOTARU NO HAKA, was directed by Isao Takahata and it was an upsetting adaptation taken from a true story script by Akinori Nosaka and based on facts happened during the Second World War. Toru Hara called up in the role of key animators Shoetsu Hane, Hideaki Anno, Noboru Takano, Megumi Kagawa and Masuji Kigami, under the clever supervision of the new-coming Yoshifumi Kondo. This film conveied a unique and strong anti-war message and a touching testimony of the human spirit. In the same 1987, a handful of artists by now entered already the sphere of Ghibli's main collaborators, made the most of the key frames on DEVILMAN's OVA. In fact Tokyo Momonga is not anything else other than the name of the group formed by Katsuya Kondo, Shinji Otsuka, Masaaki Endo and Toshio Kawaguchi. If we also add the partecipation of Michiyo Yasuda and Katsu Hisamura to the realization of the backgrounds, we can officially say that this OVA has been achieved by Miyazaki's studio at least for a good 50%. It is my duty to remember that the director Tsutomu Iida, was the Miyazaki's first assistant on LAPUTA. HOTARU NO HAKA was not sponsorized by Tokuma. It has been in fact produced in association with Shinkosha. The film had almost 55.000 drawings. The composer Joe Hisaishi did a wonderful work on TONARI NO TOTORO. 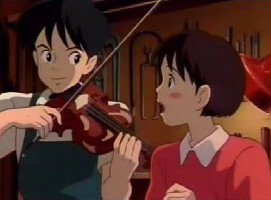 Hayao Miyazaki wrote the lirycs for ending song. It was sung by Azumi Inoue. The poetical and joyful TONARI NO TOTORO by Hayao Miyazaki, went against dramatic atmospheres of his colleague. Yoshiharu Sato took care of character sketches and continuity design, while Kazuo Oga did artistic direction. A number of backgrounds were made by Hidetoshi Kaneko, who so returned to work for Toru Hara (he was in fact one of the art-directors in THE HOBBIT and in the dull THE DRAGON THAT WASN'T; today he is well-liked for his beautiful background paintings in the OVA series of RECORD OF LODOSS WAR). This work marked the end of Tsukasa Tannai's partnership. Tannai left Ghibli to take up the role of animation supervisor at Studio Gallop along with Kazuyuki Kobayashi. TONARI NO TOTORO was the first Ghibli's film to be officially released in the U.S.A. This movie was distributed in 1988 by Toho's cinema, but the success was just modest, covering hardly the highest production costs. Eight years before, the producers of the TMS had seen correct when they re-sent back the storyboard, which had to be retained as a project with a scarce potentiality from the commercial point of view. This is one of the few times that Oh! Production didn't participate in the making, since the additional drawings were signed by Madhouse. The fluidity of the movie was also guaranteed from the skillful I/B animators at Studio Fantasia and Anime ToroToro. This one was set up by veteran director Yuki Kinoshita and it will be fixed presence in the next films produced by Ghibli. Studio Ghibli's actual headquarters at Koganei. 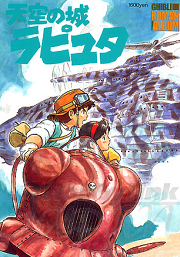 And so, when Ghibli's adventure seemed to be arrived at its epilogue, Toshio Suzuki tried to convince Miyazaki on planning of an animated feature film based on the best-selled book by Eiko Kadono. Miyazaki accepted to do it. 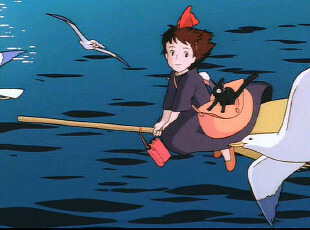 MAJO NO TAKKYUBIN (KIKI'S DELIVERY SERVICE) was completed and relaesed in July 1989. This was the first time Miyazaki do not realized a subjet. 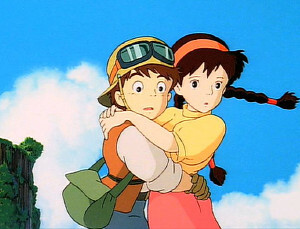 In despite of it, MAJO NO TAKKYUBIN was the most successful film ever made in Japanese animation. 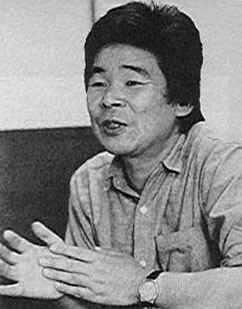 Toshio Suzuki in this occasion assumed the role of associate producer, while Isao Takahata did music direction. Animation quality was radically increased and saw Yoshinori Kanada (free-lance that partecipated in many important 80's animated movies), Shoetsu Hane, Megumi Kagawa and Yoshinori Sato involved as key animators under the supervision of Yoshifumi Kondo, Katsuya Kondo and Shinji Otsuka. Katsuya Kondo (who has no relationship with Yoshifumi!) did an accurate character-design too. This movie was also the beginning of Sachiko Sugino's partnership with Studio Ghibli (firstly she was trained at Osamu Dezaki's studio). Studio Cockpit (established in 1978 by an Eiken's ex-producer), worked side by side for the first time with Oh! Production, Anime ToroToro and Doga Kobo in the making of a Ghibli's movie. Box office widely exceeded production and advertising costs, setting in the same time a new quality standard. Curiously, after this triumph all the following Ghibli's movies were released in July.. It marked the unique collaboration with the well-known art director Hiroshi Ono. Hayao Miyazaki was executive producer in OMOIDE POROPORO, directed by Isao Takahata. Toshio Suzuki once again was in the role of associate producer. Yoshifumi Kondo, who also did character sketches, Katsuya Kondo and Yoshiharu Sato did animation supervisors. In the role of key animators were chosen Mahiro Maeda, Megumi Kagawa, Shoetsu Hane, Junko Ikeda, and Tomoko Kida as editor (everyone of them already worked on NAUSICAÄ). From LAPUTA's staff were called back Masako Shinohara, Masaaki Endo and Noriko Moritomo (She was one of the first Nippon Animation's employees to join Ghibli). A young I/B animator named Masashi Ando begin its career in the main staff: he will then become key animator in the forthcoming film. Toru Hara left Studio Ghibli after eight years of permanence because he held the new studio facilities too expensive. Another anime movie released by Studio Pierrot, but that it could have been confused with a Ghibli's production, was KUMO NO YONI, KAZE NO YONI. But this is not the case, since Katsuya Kondo has only realized the character design of it. OMOIDE POROPORO counted almost 74.000 cells, more than every other Ghibli's movie previously made. The merit of this success was due to the art director Kazuo Oga. He was assistant of well-known Shichiro Kobayashi. The ending song of KURENAI NO BUTA was wrote and sung by Tokiko Kato. KURENAI NO BUTA was originally conceived as a promotional short-length for Japan Airlines (JAL). Toshio Suzuki doubts about KURENAI NO BUTA success, but it was another triumph for Studio Ghibli. The movie reached almost immediately the top of the most seen movies. After this production, Studio Ghibli moved in new and modern facilities at Koganei, a green suburb of Tokyo. Unfortunately, the joyful atmosphere due to this success was soon ruined by the sad news of Yasuji Mori's dead. He was one of the earliest Nippon Dogasha's (the actual Toei Animation) founders and he formed many of the animators who worked into Ghibli, including Hayao Miyazaki. After this film Yoshiharu Sato left Ghibli to carry on the collaboration with Nippon Animation. 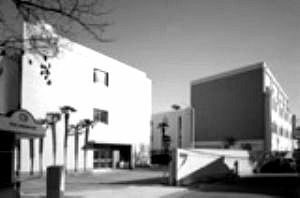 Its style was one of the real points of strength of these studios for over 20 years. In the making of POMPOKO a bit of 3D/CGI was used to correct some complex backgrounds. Toward the end of 1993, UMI GA KIKOERU was released in the cinemas for a brief period of time. UMI GA KIKOERU was the sole tentative to produce a TV special. It was considered a wrong step, because the advertising sponsors didn't covered all the expensive production costs. Tomomitsu Mochizuki was chosen as supervising director. He also wrote the lyrics for the theme song. Katsuya Kondo did the characters sketches and continuity design. This was the first time Ghibli's name wasn't associated with Takahata and Miyazaki as well. They were fully involved on planning the next long-length theatrical release. POMPOKO illustrated the destruction of the natural world caused by the men and the forest's own reaction. The ecological message had already been introduced many times (ten years before, NAUSICAÄ gained a WWF award). For continuity design were selected the same artists that took care of it on KURENAI NO BUTA: Megumi Kagawa and Toshio Kawaguchi (he who did the opening animation in LAPUTA). Even though Suzuki had some doubts, it was very successful in the Japanese best ranking, reaching the discussed hit THE LION KING (it is undoubtful that Disney copied situations and characters of Tezuka's JUNGLE TAITEI. Disney did it voluntarly or in unintenional way? We don't yet known it...). The merit of this success was above all for partecipation of some Telecom key employees such as Kazuhide Tomonaga and Nobuo Tomizawa (both had set up this studio togheter with the greatest ex-Toei veteran Yasuo Otsuka). 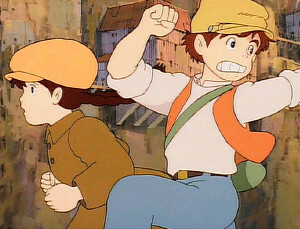 In both films Masako Shinohara and Yoshifumi Kondo did the main key animations together with some young artists grown in the studio, such as Takeshi Inamura and Masashi Ando. 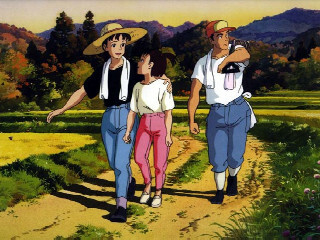 The title song was a Japanese version of Jonh Denver's Country Roads. It was sung by Yoko Honna. This was not the sole short-length produced by Studio Ghibli. There're in fact various tentatives for NTV's adversting. 1995 was the time for Yoshifumi Kondo to become supervising director on MIMI WO SUMASEBA. In this project Hayao Miyazaki did the whole storyboard design. Kitaro Kosaka took care of continuity design, which was faithful to the original manga by Hirogi Aoi. In the role of art director was chosen Satoshi Kuroda, who was a fixed employee of Ghibli since 1991, but already in the backgrounds department of MAJO NO TAKKYUBIN together with Kazuo Oga and Hidetoshi Kaneko. Furthermore, for Takehiro Noda was finally come the promotion in the role of key animator. Initially, he did the I/B animations on OMOIDE POROPORO. At that time was also produced ON YOUR MARK, a surprising short-length music-clip for pop group of Chage & Aska. 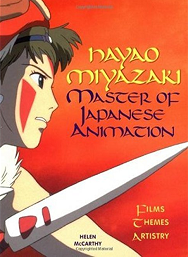 This was directed by Hayao Miyazaki, while Masashi Ando and Yoji Takeshige were respectively involved as animation supervisor and art director. But was during the summer 1996 that arrived a very important surprise. Walt Disney acquired the rights for the pluri-delaied MONONOKE HIME and almost all Ghibli's movies, including Topcraft's NAUSICAÄ. This notice was immediately published by any journal all over the world. MONONOKE HIME presented resemblances with NAUSICAÄ, as many epic scenes or love for natural beings, but differently, it was set in the Middle Age Japan, showing characters and sceneries never known by the Western public. Disney, for over ten years, had already took advantage of Japanese studios to made some of its products (amongst others DUCKTALES, WUZZLES, THE TIGGER MOVIE, POCHAONTAS 2 and much more), but this deal still render it an undisputed giant in the international animation market. Time before, Tokuma and Ghibli had already been contacted by several western distributors but was Buena Vista that they at last chosen. Furthermore, Disney can be one of the sponsor of the future Ghibli's movies. Considering this market policy, we may consider the recent TONARI NO YAMADA KUN, SEN TO CHIHIRO and HOWL NO UGOKU SHIRO as co-productions between Japan and USA. "Miyazaki makes successful movies for families: this is still your most important target" says Jonh Roth, president of Walt Disney Studios. Miyazaki visits DR-Movie headquarters in Seoul. MONONOKE HIME was finally premiered in Japan on July 1997, counting near 140.000 drawns. To complete them in time for the final scheduled date, was used Digital Painting. 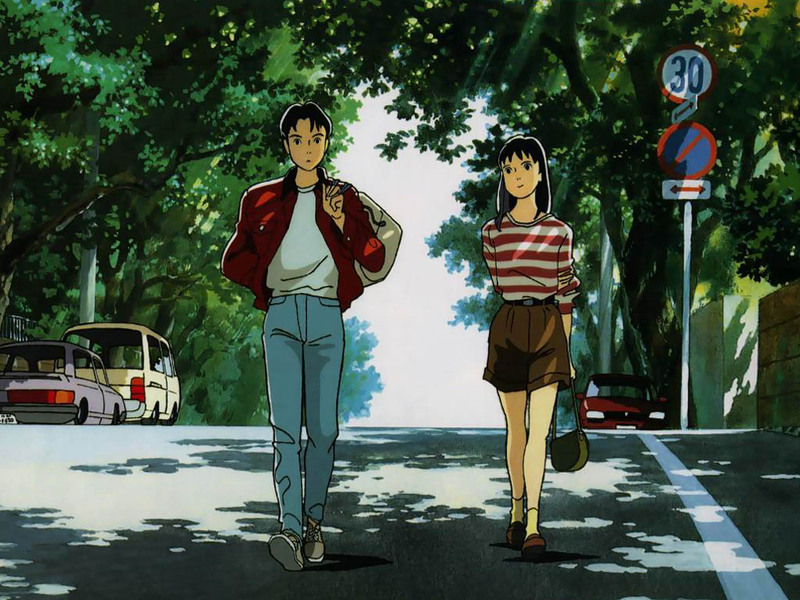 The main staff counted nearly two-hundreds animators, among others Megumi Kagawa, Masaaki Endo, Toshio Kawaguchi, Noriko Moritomo, Masako Shinohara, Takeshi Inamura and Takehiro Noda. Masashi Ando, Yoshifumi Kondo and Kitaro Kosaka did the continuity design with the utmost care. Some of them were with Hayao Miyazaki since Ghibli's foundation. Kondo worked for the last time since he suddendly died at the age of 50. Furthermore, this new Miyazaki's masterpiece marked the support of Seoul's DR-Movie. Each external facility is rigorously checked by Ghibli's inspectors. It was the first time that Ghibli took advantage of a Korean facility, altough the most part of the worldwide animation business started long time before to make series there. This long awaited Miyazaki's movie also signs the last collaboration with Yoshinori Kanada. 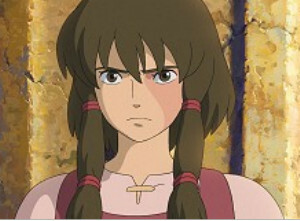 Even if it was a veritable triumph for Miyazaki and Studio Ghibli, Disney was doubtful to released it in the USA, perhaps because of some strong sequences which were catalogued unsuitable for a children's audience. 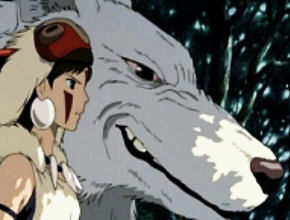 PRINCESS MONONOKE was released uncut in 1999 by Buena Vista's subsidiary Miramax Film. "About a masterpiece such as MONONOKE HIME, when you'll see it, you'll immediately want to have every Miyazaki's movie!" Andy Wachowski (taken from SEN TO CHIHIRO Italian press-release). In Japan, MONONOKE HIME was exceeded only by the colossal TITANIC directed by Cameron. As guest key animator was called Atsuko Tanaka, one of the many talents inside TMS/Telecom. The next amusing TONARI NO YAMADA KUN was directed by Isao Takahata and based on the famous comical daily strips by Hisaishi Ishii. Miyazaki had any role in it, because he was completely exhausted after three years of working on MONONOKE HIME. Yoshiyuki Momose did the whole layout design in YAMADA KUN. He has been one of the most important artists at Ghibli, because designed every one of the movies of Isao Takahata. Momose was one of the senior draftsmen at Nippon Animation during the 70's and the 80's and he's also the co-founder of Mook-DLE. This was not the first time that Hisaishi Ishii's manga were brought in animaton. In 1986 was in fact released a feature film titled OJA MANGA YAMADA KUN, but it was a Group Tac production. 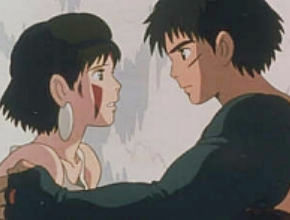 Everybody in Studio Ghibli considered it too distant from previous works. Toshio Suzuki was hesitant, but at the same time was a great admirer of this manga. However, the success was enough modest and the movie was the sole flop of his management. Nevertheless it was important, because marked the end of the analogical era. No cel was in fact used, cutting the high production costs of manual painting. Its final cost was 19$ million, an exorbitant amount of money for Japanese Animation, but still five times less than a Disney film. It marked an important turn in marketing distribution. Ghibli's exclusive passed from Toho-Group to Tohoku Shinsha. 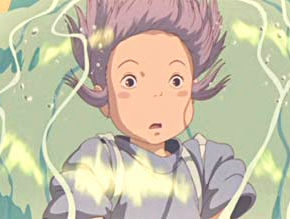 Fortunately, the next SEN TO CHIHIRO, directed by Hayao Miyazaki, reached over any expectation. 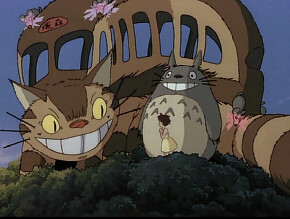 This suggestive and picturesque fable was a Miyazaki's return to the spirituality of TOTORO. As art director was chosen the skilful Yoji Takeshige (he was born at Philadelphia in 1964 and prior to it he was the role of background artist in TONARI NO TOTORO, OMOIDE POROPORO and KURENAI NO BUTA). There are no many action sequences, but its technique set a new standard in the world of Japanese animation, thanks to the experience of Masashi Ando, Kitaro Kosaka and Megumi Kagawa. Above all, this new further Miyazaki's masterpiece has been the most awarded Studio Ghibli film. It won a prestigious Golden Bear at 2002 Berlin Film Festival, several well-liked Annie Awards and the Christopher Award as well. At last, it has also been nominated to the Academy Award as best animated movie, although Disney has two of its movie in the list. And so, SPIRITED AWAY won Academy Award for Best Animated Film! 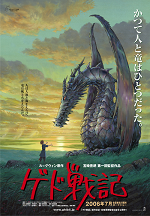 Unfortunately, because of the newest International Crisis, Miyazaki was unable to attend the ceremony.The forthcoming HOWL NO UGOKU SHIRO, scheduled for Summer 2003 has unfortunately had a new further delay. The projected release is now Summer 2004. 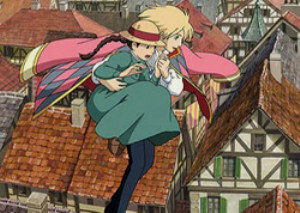 Mamoru Hosoda had been selected to direct the film, but he left the project and Miyazaki has taken up the director's role. 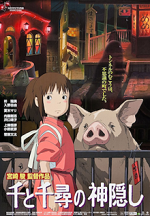 Venice: Miyazaki receives the prestigious Leone D'Oro! 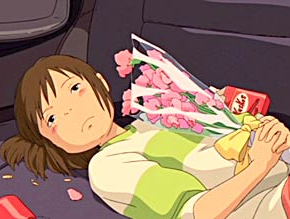 In 2002 Studio Ghibli released NEKO NO OGANESHI, a smaller considered film as visual impact, since it has been made with a limited budget and subcontracted in a large part to the Korean DR-Movie. The direction was submitted to Hiroyuki Morita. And also for Toshio Suzuki's studio was the moment to bring on the screen a novel of the western literature. In fact HOWL NO UGOKU SHIRO is a free adaptation of the well-known book of Diana W. Jones. This was one of the best efforts made by Ghibli's staff. A masterpiece, a landmark of the animation history. A perfect screenplay by Hayao Miyazaki, a wonderful background styling by Yoji Takeshige, and a great and fluid animation by Kitaro Kosaka, Takeshi Inamura, and Akihiko Yamashita (storyboard artist and key frame supervisor on the amazing GIANT ROBOT's OVA series). And we don't have to forget that a slice of the success also goes to the music performed by New Japan Philharmonic Orchestra and to composer Joe Hisaishi, who is one of the many irreplaceable collaborators of Miyazaki. It almost immediately became Japan's highest box-office ever. The main staff includes great names such as Shinji Otsuka, Makiko Futaki, Masako Shinohara and Kenichi Yamada (I/B animator until 1996). Several addittional firms supported the production, Madhouse, Oh! Production and Doga Kobo among others. Despite the trend of subcontracting, the animation process was fully made in Japan, with no support of Korean facilities. Another short anime film that shows the extremely well-known Ghibli's imprint was NASU ~ SUMMER IN ANDALUSIA. But this is a Madhouse production! In fact the character design was achieved by Kitaro Kosaka, who's artistically grown inside Oh! Production, where he participated in works as NAUSICAÄ and LAPUTA. The movie had receveied hoards of awards all around the world, among which an important technological contribution prize at Venice Film Festival. Thanks to Disney/Buena Vista the film has been distributed in the United States, but a scarce promotion has decreed the flop at the box office. 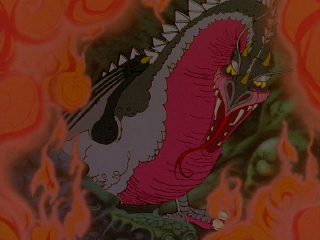 The character design of GEDO SENKI was taken from an old Hayao Miyazaki's manga named SHUNA NO TABI. The music was composed by Tamiya Terashima and the theme song was written by Akino Arai and Goro Miyazaki himself. To 4 year-old distance from the amazing HOWL a Miyazaki's new film was produced. It's about an enchanted goldfish who befriends a little boy named Sosuke. 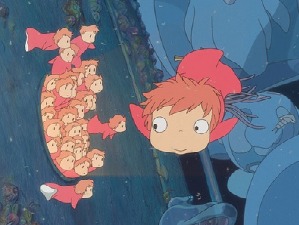 Peculiar characteristic of GAKE NO UE NO PONYO was the absolute absence of CGI. In fact, the computer was exclusively used in painting more of 17.000 sketches that they were achieved for the film. The art-director Noboru Yoshida supervised a team of 20 young artists hocked in the realization of the backgrounds. The impressive action scenes bring the signature of Atsuko Tanaka and Makiko Futaki, both among the few veterans to have maintained a respectful role in Studio Ghibli and both collaborators of Miyazaki from the establishment of Telecom. Further to Anime ToroToro as support facility, for the first time were also involved Tatsunoko and Brain Base. The animation, taken care of by Akihiko Yamashita, Megumi Kagawa and Kitaro Kosaka with the supervision of Katsuya Kondo, was absolutely fluid. As well as, the wonder of colors conceived by Michiyo Yasuda is among the most beautiful things that she has done for Ghibli. In terms of quality, this movie was one of the maximum efforts of the Japanese animation. Despite it was released in well 481 cinemas, a record for an animated movie, the film it boxes a lot less than the precedents. Tendency that it has taken beginning from HOWL. Will it be for the theme, since the film was destined to a children's audience, or for the competition of Pixar's works, beloved by Japanese people? The film was also released in US theaters on August 15, 2009, but had a modest success. In Japan this movie had to be seen by twelve million people. Up to 2009 it was at the fourth place on the receipts history of Ghibli. Even if it was showed and acclaimed at Venice Festival, it's been excluded from the five best animated films run for the Academy Award. In these years, Ghibli is become effigy of quality, an undisputed institution amongst worldwide animation companies. It brought to success disparate genres with an eye of respect to the family audience, aiming on noble sentiments such as friendship, sincerity, and respect. Today, its partnership with USA (started with the foundation of Topcraft), is real reinforced, due to the recent Disney's agreement. But the next film has not struck the media, of it for the choice of the director, the young Hiromasa Yonebayashi, of it for the subject, "The Borrowers" of the late English authoress Mary Norton. Now the road is in slope and a sole interrogative remains: who will be the successors of Miyazaki and Takahata? TOM SAWYER was a part of The Festival of Family Classics. How many episodes of Festival of Family Classics were made at Topcraft? Today a complete list doesn't yet exist. Was Topcraft founded as Videocraft Dentsu? Videocraft was the former name of Rankin/Bass Productions in Japan. Has Miyazaki worked on THE LAST UNICORN? 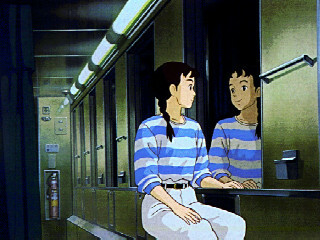 Miyazaki at that time was employed in Telecom Animation Film (TAF). Does a sequel exist produced by Osamu Tezuka? They are 2 completely different films. THE LAST UNICORN was based upon a book of Peter S. Beagle. 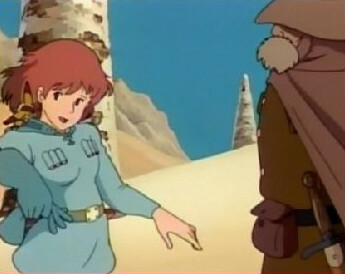 Was NAUSICAÄ animated by Nibariki? Nibariki is the name of Miyazaki's agency that owns all the rights of author to his works. The official 1993's Pacific Animation logo. Was Topcraft involved in THUNDERCATS? 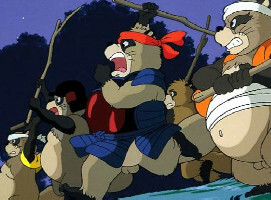 A number of episodes was achieved by Pacific Animation Corp. and AIC. Was its wondering intro work of Yoshinori Kanada? That sequence brings the signature of Masa Yuki, who was a great fan of Kanada. Will the new TV-series be animated by a Japanese crew? Warner has announced it for 2011. It will be animated from Studio 4ºC. Was the sequel of YOKAI NINGEN BEM recently broadcast? Yes. But it is a 2006's Studio Comet production. Were Kazuya and Akira Miyazaki a pseudonym of Hayao Miyazaki? They're scriptwriters that collaborated with Nippon Animation and other companies. Hayao Miyazaki used the name Tsutomu Teruki in the second TV series of LUPIN III. The only official Web-site on Rankin/Bass Productions. It is edited by Rick Goldschmidt. about the history of the worldwide animation. and pictures about Peter Jackson's movies. It's the greatest Web-site about anime and manga ever made. My friend Fabio published the previous version of my article. Today, unfortunately, its Web-site no longer exists. One of the first Web-site that featured all concerning Miyazaki and Studio Ghibli. This is not the official site and is not in any way connected with any animation studio or corporation. It is maintained by fans for fans. Upkeep of the site is a purely volunteer effort not controlled by, nor representing any commercial entity. This site contains no anticipation about the story synopses.